John Karrel is our man. He cites his “least favorite” corner: the intersection of Hillspoint and Greens Farms Road. You’re not supposed to pitch a business. Would someone really choose a fitness option this way?! This entry was posted in Local business, Politics, Westport life and tagged Sign pollution. Bookmark the permalink. 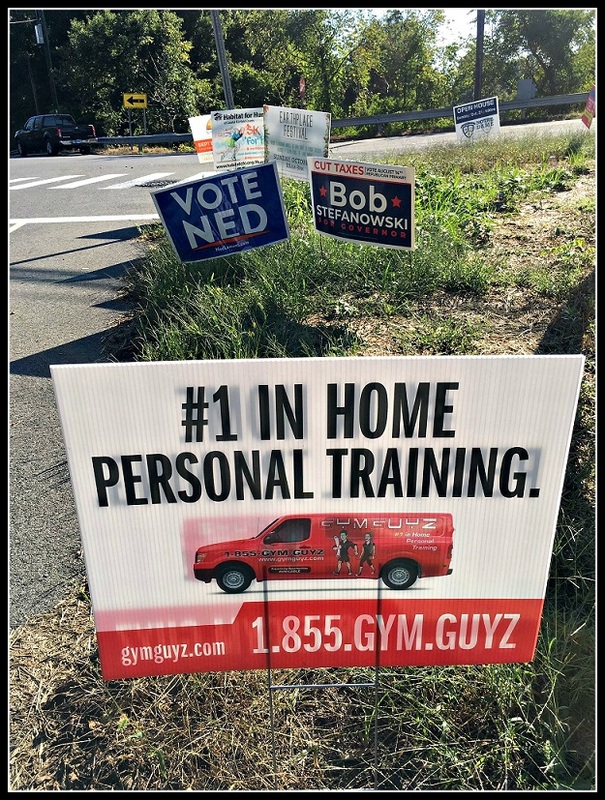 sSigns like this and all election signs are imply VISUAL POLLUTION; they don’t sway votes, they may turn people off if enough of them intrude on one’s psyche…The town should ban them…..
Has anyone ever voted based on a lawn sign? Yes I have IF the sign was on the lawn of someone I know and respect. Signs are the least of problems at that particular intersection. I live in Norwalk, and take sign like that down in my neighborhood. There is no free advertising near where I live! town previously. How about Signage Civility?